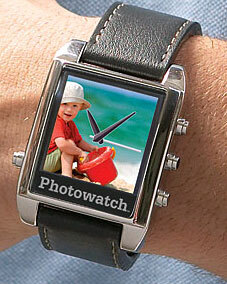 Photo Watch [Photo Watch] - $99.95 : NewDaVincis.com!, Great Innovative Products, Gadgets and more. It?s a simple, elegant, all-in-one solution! See your photos, see the time, or see both?the watch can superimpose the time over your pictures. Digital picture watch. Share your photos without bulking up your wallet or carrying a separate device. - Drag and drop photos directly from your computer. - Included software downloads directly from watch via USB interface. - Easily crop and edit images for best fit. - USB rechargeable for up to 8 hours of viewing per charge. - Compatible with Windows 2000/XP and Mac OS. Shows the date and time. Shows off your favorite photos. Display the date and time in digital or analog format. Or hide the clock to clearly view your pictures as single images or a slideshow. Watch stores up to 60 pictures and displays them on a high-resolution LCD display. You can view one picture at a time, choose a slideshow, or adjust the contrast. Also shows the day and date. Plug and play technology means the included software downloads directly from the watch. Software lets you drag and drop photo files on your computer desktop to download. It?s easy to crop and edit pictures, too. Watch is USB rechargeable, with up to 8 hours viewing time per charge. Contoured stainless-steel case and black leather watchband.